The province of Ilocos is not only about the different historical sites and/or wonders of nature as it also offers extreme activities for adventure/thrill seekers. 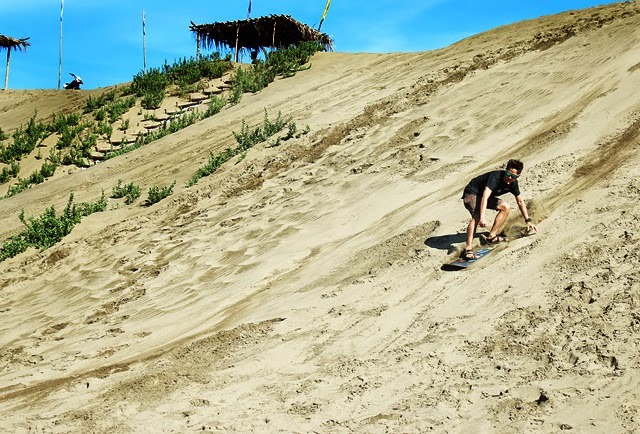 La Paz Sand Dunes in Paoay, Ilocos Norte is a known site where the extreme 4x4 ride and sand boarding are being held. Sand Dunes already gained popularity as one of the must visit place when in Ilocos Norte. It has been featured to different blog sites as well as on television and films. In fact, some scenes taken from the local movie, Panday (FPJ version) were shot in Sand Dunes. The hotel we stayed-in offers a complete Ilocandia tour (Ilocos Norte and Sur). As for our group of 5, we paid 2,990 pesos/pax (price varies depends on the number of head count) which includes a private aircon van transportation to Laoag-Vigan-Pagudpud, a hotel accommodation for 2 days and 2 nights, a daily set of breakfast, entrance fees, toll fees, driver's meal, and as well as airport transfers. Airfare is not included. Oops, before I forgot, the name of the hotel is UKL Ever Hotel and it is located in Laoag City. It is also 15 minutes away from the airport. A trip to Sand Dunes is not included in the package above. We avail it separately from UKL. We paid 500 pesos per head to experience it. It includes transfer from UKL to La Paz Sand Dunes (two-way), 30 minutes 4x4 ride, and unlimited sand boarding experience!